The Northern Barred-Woodcreeper is one of our most impressive woodcreepers, rivaling all others in size at 26 cm in length. It is distinctly barred on its head, back and underparts, allowing it to be easily identified among this challenging group of Neotropical birds. Its tail is rufous and unbarred, and like all other woodcreepers, has stiffened feathers to use as support when creeping up trees. It has a heavy, straight bill, blackish in color. 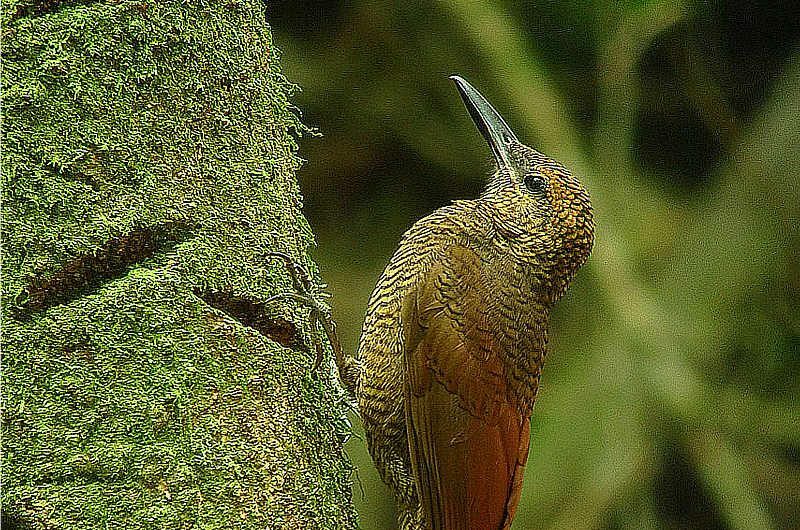 The Northern Barred-Woodcreeper is uncommon in the lowlands and rare in the foothills of Panama, but can be seen regularly around the Canopy Tower. This large woodcreeper is found in the lower levels of the forest. It regularly attends army ant swarms, and occasionally forages in mixed feeding flocks. It is solitary and lethargic, and often remains motionless while clinging to a tree trunk for extended periods of time. It eats a wide variety of arthropods, usually picked up from antswarms or gleaned from foliage, trunks, and occasionally in the air. It is also known to eat small lizards. It sounds off its distinctive, upward-slurring repeated whistle call, usually made up of 3 to 6 notes, most frequently at dawn and dusk, alerting us to its presence nearby. Natural tree cavities are chosen as nests, usually between 1.5 and 6 meters above the ground. Two chicks are reared during a rather prolonged nesting season between February and November. The Northern Barred-Woodcreeper used to be considered conspecific with the Amazonian Barred-Woodcreeper (D. certhia), but the two species differ morphologically, vocally and behaviorally. Primarily a Central American species, the Northern Barred-Woodcreeper ranges from southeastern Mexico to northwestern South America. In Panama, it is found along the entire Caribbean slope and on the Pacific slope in eastern Panama, up to 1100 meters elevation. It is a favorite woodcreeper to find around the Canopy Tower and Canopy Camp Darien.